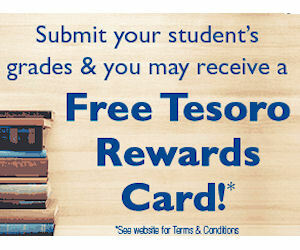 Free Tesoro Reward Card for Good Grades! Students aged 13 to 23, who are enrolled at a qualified academic institution can earn a free Tesoro reward card for getting good grades. The higher the grades, the higher the value of the reward card! Participants must reside in Alaska, Hawaii, Idaho, Minnesota, North Dakota, Oregon, South Dakota, Utah, Washington or Wyoming.